Spanish wine is not often as celebrated as the wines from France, Italy and the like. However, the wine making tradition in Spain is glorious and there are some of the best wines in the world coming from many appellations in this beautiful country. One of the traditional regions, Rioja, is capable of making wines that rival the best in the world, particularly from such wonderful producers as Lopez de Heredia, many of which are represented below. The traditional grape in this and many nearby regions is Tempranillo, a grape capable of great perfume and subtlety. Below are a number of recent Spanish wine tasting notes to give you an idea for what these wines can be like. This here is one of the great red Riojas. In Spanish wine, Lopez de Heredia is a respected, traditional producer who spares no expense to make world class, classic wines. I've talked them up before below. This Reserva is the current vintage since they age the wines so long at the domaine prior to release. The current Gran Reservas, aged even longer, are much older! This one is 80% Tempranillo, the primary grape of Rioja, with the rest made up of a blend of Garnacho, Graciano and Mazuelo. Very pretty aromatic complexity of sandlewood, white pepper, spice and red fruits. Delicious, pure and silky, the flavors of leather, spice and red fruits are presented in a fine, intense and silky mouthfull. There is the slightest hint of alcoholic heat on the finish but in my opinion it only serves to brighten the spice and red fruit flavors that linger well after you've swallowed the wine. Bravo! But I'm not surprised, it is Lopez de Heredia after all. The region of "El Berramador" is in the small wine producing region of Spain called Utiel-Requena. The region produces many wines of different grapes but this one is 100% old vines Tempranillo. It is from an old producer who celebrated their 100 year anniversary with this wine. It was held in wood barrels for 4 years, followed by 4 years of bottle aging at the domaine. 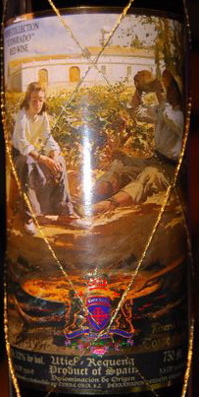 It is sold in beautiful 2 and 3 bottle boxes with labels that display several different artistic backgrounds. Truly beautiful packaging for a great wine! Yes, this is an old wine to be reviewing just now. However, much of this was recently released to the market and some of it has been available for well below its initial price. This wine is not to be missed! It starts with an aroma which is floral and earthy at the same time, like dried, crushed rose petals scattered on the wet earth with mushrooms pushing up beneath. The flavors are bright and vibrant but with complex secondary inner-mouth perfume nuances of earth and mushroooms. Tart, bright, crunchy red fruits linger on the finish, reminiscent of a Chambolle-Musigny. This would be very good at $30 but on sale at $9 this was an absolutely outstanding value. While I have enjoyed several López de Heredia red Riojas, this was my first white if I am not mistaken. This is one of best producers in Rioja and Spain and the world. They can make Spanish wine lovers out of anyone! This white, made from 100% Viura, is aged for 4 years in wood prior to being bottled and then an additional several years in bottle at the domaine. The 1996 is the current vintage! And this is just the Crianza...the Reserva and Gran Reserva being much older! The aromas and flavors are smokey, stony and quite complex. Not overly oaky, this has mature notes of spice and nuts but is still very fresh and lively. Dry, silky and long, this is the real deal and not to be missed! As mentioned above, López de Heredia is a fanatical and traditional producer from Rioja in Spain who makes outstanding examples from the appellation. While best known for their old, long-aged red wines, their white (above) and this rosé are absolutely outstanding as well. Aged for 4 and a half years in barrel prior to bottling and further bottle aging at the domaine, it is made from 30% Tempranillo, 60% Garnacho and 10% Viura grapes. Smokey and stony strawberry aromas and flavors are serious, dry and complex for a rosé. This has the power, complexity, finesse and fine mineral presence on the palate that you would expect of a great wine, which is all too uncommon for a "lowly" rosé. This is not a fruity, simple rosé. This is serious wine! While Tempier rosé is more famous, this is every bit as good and quite distinctive. Its core of living personality is something to behold. I wouldn't be surprised if this continued to improve with some additional bottle age as well. Great stuff. Great Spanish wine. Muga is another big Spanish wine producer in the Rioja region, most famous for their red wines. This was my first experience with their rosé. Very fruity nose of ripe strawberries, this wine is one dimensional but fresh and delicious. Tasted alongside Lépez de Heredia, this has less complexity and also less structure, but it makes up for it somewhat with a nice spiciness which promises to go nicely with Spanish summer cuisine like Tapas. A pretty, unassuming rosé value. Rioja is one of the best known regions in Spanish wine. It is in the northeast of the country and for red wines the most prominent grape in most wines is Tempranillo, although it can be blended with several other local varieties. This wine contains 80% Tempranillo with Garnacha, Mazuelo and Graciano making up the difference. This is the crianza bottling, which is aged 15 months in oak followed by 6 to 8 months in bottle prior to release. They also make Reserva and Gran Reserva versions, the former being aged longer in bottle prior to release and the latter being aged 22 months in oak followed by up to 50 months in bottle. This Spanish wine is a Pinot Noir look-alike with fresh aromas of cherries and raspberries spiced by charred earth. With air got richer Barolo-like notes of tar and roses. The flavors are earthy, tart red fruits which lengthened and got meatier with air. A very nice, inexpensive Rioja. Done with the Spanish Wine Tasting Notes? Return to the Wine Tasting Guide page.